You are currently browsing the The Pet Product Guru blog archives for the day Tuesday, May 1st, 2018. Watch Out A Beagle is On The Run! My next door neighbor owns the sweetest Beagle. He is a friendly energetic dog. 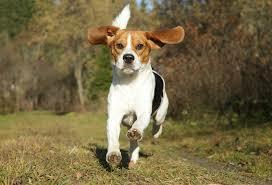 Beagles make great pets but if they get loose, they will follow their nose and run away. Yesterday, my neighbors Beagle got loose as he was going for his walk. I got in my car and searched the neighborhood and after a little while, I heard a dragging sound in the back of my car. I stopped, got out and their was little Bartley strolling down the street, dragging his leash. I reached for the leash and Bartley was glad to come along with me as I took him home. All is well with little Bartley. The Beagle is one dog that follows his nose! This is a deep, inbred instinct and therefore having a dog that runs away and chases after scents is part of owning a Beagle. This is not to say that this cannot be controlled in a healthy way. For details on this and some great tips to help with this issue, read: Beagle Running Behavior . Thanks to Beaglepro.com for giving us a great resource to help curb this behavior. The oldies are playing! Don’t miss them! EDGEWATER GOLD RADIO plays oldies from the 50s 60s 70s 80s and great standards! Download the free Edgewater Gold Radio app or listen on our website: edgewatergoldradio.com. add comment Comments Off on Watch Out A Beagle is On The Run!